George Ranft was born in Hell's Kitchen, New York City to a Catholic family of German descent, the son of Eva (née Glockner), a German immigrant, and Conrad Ranft, who was born in Massachusetts to German immigrant parents. His parents were married on November 17, 1895, in Manhattan. George's elder sister, Eva, known as "Katie", was born on April 18, 1896. Some obituaries cited Raft's year of birth as 1895, which the actor reportedly stated was correct on television in 1980; he is recorded in the New York City Birth Index as having been born on September 26, 1901 in Manhattan as "George Rauft" (although "Rauft" is likely a mistranscription of "Ranft"); the 1900 Census for New York City lists his elder sister, Katie, as his parents' only child, with two children born and only one living. On the 1910 Census, he is listed as being eight years old. A boyhood friend of gangsters Owney Madden and Bugsy Siegel (and later a "wheel man" for the mob), Raft acknowledged having narrowly avoided a life of crime. As a young man Raft showed aptitude in dancing which, with his elegant fashion sense, enabled him to earn work as a dancer in New York City nightclubs, often in the same venues as Rudolph Valentino before Valentino became a movie actor. Raft became part of the stage act of flamboyant speakeasy hostess Texas Guinan, and his success led him to Broadway where he again worked as a dancer. He later made a semi-autobiographical film called Broadway (1942) about this period in which he plays himself. He had a great success as a dancer in London in 1926, the Duke of Windsor was "an ardent fan and supporter." Fred Astaire, in his autobiography Steps in Time (1959), says Raft was a lightning-fast dancer and did "the fastest Charleston I ever saw." Oh yes, I knew him (George Raft). We were in a big show together. Sometimes, to eke out our miserable pay, we'd do a dance act after the show at a club and we'd have to walk back home because all the buses had stopped for the night by that time. He'd tell me how he was going to be a big star one day and once he said that when he'd made it how he'd make sure to arrange a Hollywood contract for me. I just laughed and said: 'Come on, Georgie, stop dreaming. We're both in the chorus and you know it.' [Did he arrange the contract?] Yes. But by that time I'd decided to marry... [Was he (Raft) ever your boyfriend?] How many times do I have to tell you ...chorus girls don't go out with chorus boys. In 1929, Raft relocated to Hollywood and took small roles. In Taxi! (1932), starring James Cagney and Loretta Young, Raft has a colorful unbilled dancing role as Cagney's competitor in a dance contest who wins only to be knocked down by Cagney. His big break came later that same year as the nickel-flipping second lead alongside Paul Muni in Scarface (1932). Raft's convincing portrayal and his lifelong friendships with Owney Madden, Bugsy Siegel and Meyer Lansky led to speculation that he was a gangster. When Gary Cooper's romantic escapades put him on one gangster's hit list, Raft reportedly interceded and persuaded the mobster to spare Cooper. Orson Welles explained to Peter Bogdanovich in their interview book This is Orson Welles that, as Raft's career accelerated, the actor was particularly an idol and role model for actual gangsters of the period in terms of dress and attitude. He was one of the three most popular gangster actors of the 1930s, with James Cagney and Edward G. Robinson; Raft ranked far above Humphrey Bogart in fame and box office clout throughout the decade. When the studio refused to hire Texas Guinan, the performer upon whom one of the movie's characters was based, because of her age, Raft advocated for the casting of his friend, Mae West, in a supporting role in his first film as leading man, Night After Night (1932), which launched her movie career. He appeared the following year in Raoul Walsh's energetic period piece The Bowery as Steve Brodie, supposedly the first man to jump off the Brooklyn Bridge and survive, with Wallace Beery, Jackie Cooper, Fay Wray and Pert Kelton. Raft memorably dances into the picture in his opening scene wearing a derby. 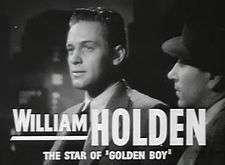 Some of his other movies include If I Had A Million (1932; an episodic ensemble film in which he plays a forger hiding from police, suddenly given a million dollars with no place to cash the check), Bolero (1934; in a rare role as a dancer rather than a gangster), Limehouse Blues (1934; with Anna May Wong), a brutal and fast-paced adaptation of Dashiell Hammett's The Glass Key (1935; remade in 1942 with Alan Ladd in Raft's role as a result of the success of the remake of Hammett's The Maltese Falcon), Souls at Sea (1937; with Gary Cooper), Spawn of the North (1938; with Raft garnering top billing over Henry Fonda and John Barrymore), two with Humphrey Bogart: Invisible Stripes (1939) and They Drive by Night (1940), with Bogart in supporting roles, Each Dawn I Die (1939; with James Cagney and Raft as convicts in prison), and Manpower (1941; with Edward G. Robinson and Marlene Dietrich). Although Raft received third billing in Manpower, he played the lead. The years 1940 and 1941 proved to be Raft's career peak. Raft chose Raoul Walsh's Manpower over The Maltese Falcon because the Falcon's director, John Huston, had never directed before and a racier pre-Code version of the film already existed. 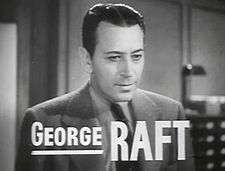 Raft was also reported to have turned down Bogart's role in Casablanca (1942), although according to some Warner Bros. memos, this story is apocryphal. Following the release of the espionage thriller Background to Danger (1943), a film intended to capitalize on the success of Casablanca, Raft demanded termination of his Warner Brothers contract. In 1946 Raft earned a reported $108,000 for the year. In 1946 Raft announced he had created his own production company, Star Films. They ended up making Intrigue and Outpost in Morocco. His career as a leading man continued through the 1940s with films of gradually declining quality often produced by Benedict Bogeaus or filmed overseas for tax benefits in Great Britain and Italy, spiraling steadily downward until his name was finally limited as a box office draw. In the summer of 1951, Raft had the title role in the radio adventure series Rocky Jordan. He played "the owner of a cabaret in Cairo whose life is steeped in intrigue." During the 1950s he was reduced to working as a greeter at the Capri Casino in Havana, Cuba, where he was a part owner. In 1953, Raft also starred as Lt. George Kirby in a syndicated television series police drama titled I'm the Law (in which he invested his own money), which ran for one season and was one of the earliest instances of a movie star of his previous calibre accepting the lead in a TV series. He wound up occasionally accepting supporting roles in movies, such as playing second fiddle to Robert Taylor in Rogue Cop (1954). Raft satirized his gangster image with a well-received supporting performance in Some Like it Hot (1959), but this did not lead to a comeback, and he spent the remainder of the decade making films in Europe. He played a small role as a casino owner in Ocean's 11 (1960). Granted a year's visa to the United Kingdom in 1966, Raft was a greeter in several clubs where he had a cameo in 1967's James Bond spoof Casino Royale. In the early 1970s, Raft appeared in a now-famous Alka Seltzer television commercial playing the role of a prison inmate. He was an American English-speaking syndicate leader alongside French actor Jean Gabin in the 1966 French gangster movie, Du rififi à Paname, and his final film appearances were in Sextette (1978), reunited with long-ago co-star Mae West, and The Man with Bogart's Face (1980), a nod to 1940s detective movies. Raft married Grayce Mulrooney, several years his senior, in 1923, long before his stardom. The pair separated soon thereafter, but the devoutly Catholic Mulrooney refused to grant a divorce, and Raft remained married to her, and continued to support her, until her death in 1970. 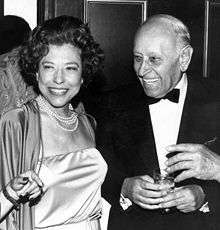 A romantic figure in Hollywood, Raft had love affairs with Betty Grable, Marlene Dietrich, Tallulah Bankhead, and Mae West. He stated publicly that he wanted to marry Norma Shearer, with whom he had a long romance, but his wife's refusal to allow a divorce eventually caused Shearer to end the affair. Raft died from leukemia at the age of 79 in Los Angeles, California, on November 24, 1980. Two days earlier, Mae West had died and their bodies were at one point alongside each other in the hallway of the mortuary for a coincidental silent reunion almost half a century after their first film together. Raft was interred in Forest Lawn – Hollywood Hills Cemetery in Los Angeles. Raft's personal effects, wardrobe, etc., were sold by means of a simple classified advertisement, listing the lot for $800 in Hemming's Motor News in the fall of 1981. 1 2 3 United States Census 1910; Census Place: Manhattan Ward 12, New York, New York; Roll: T624_1025; Page: 19A; Enumeration District: 0668; Image: 1107; FHL Number: 1375038. ↑ George Raft birth data, italiangen.org; accessed August 15, 2015. ↑ United States Census 1900; Census Place: Manhattan, New York, New York; Roll: T623_1109; Page: 4B; Enumeration District: 642. ↑ via Associated Press, "'Tough guy' George raft dies of emphysema at 85", The Milwaukee Sentinel, November 25, 1980; accessed August 10, 2009. "After growing up in New York's tough Hell's Kitchen area, Raft was a boxer, electrician and baseball player before landing a job as a dancer in nightclubs in the 1920s." ↑ Yablonsky, Lewis George Raft iUniverse 2000; ISBN 0595010032 p. 238. ↑ Astaire, Fred, Steps in Time; ISBN 0-06-156756-6. ↑ Beaver, Jim. "George Raft", Films in Review (April 1978). ↑ Yablonsky, Lewis George Raft, New York: McGraw-Hill Book Co., 1974. ISBN 0-07-072235-8. ↑ Parish, James Robert. The George Raft File: The Unauthorized Biography. New York: Drake Publishers, 1973; ISBN 0-87749-520-3. ↑ Behlmer, Rudy. Inside Warner Bros. (1913–1951); ISBN 0-671-63135-7. ↑ M'CAREY'S WAGE OF $1,113,035 YEAR'S HIGHEST: Treasury Report Places Film Producer First, Chicago Daily Tribune (1923–1963) [Chicago, Ill], June 17, 1946: pg. 6. ↑ RAFT IS ORGANIZING OWN MOVIE STUDIOS: Actor and Sam Bischoff Will Produce as Star Films, Inc. --James Mason in Deal Special to THE NEW YORK TIMES.. New York Times (1923–Current file) [New York, N.Y] 13 Sep 1946: 5. 1 2 Scannell, Walter (Winter 2014). "Tough Guys Do Dance". Nostalgia Digest. 40 (1): 26–31. ↑ Heller, Jean (October 30, 1969). "Funds For Parvin Foundation Came From Flamingo Hotel Sale". The Evening Sun. Hanover, Pennsylvania. p. 29. Retrieved August 29, 2016 – via Newspapers.com. (registration required (help)). Other stockholders included singer Tony Martin and actor George Raft. ↑ Wallace, Stone. George Raft: The Man Who Would Be Bogart; ISBN 1-59393-204-9. 1 2 Warren, Doug; Cagney, James (1983). Cagney: The Authorized Biography (Mass Market ed.). New York: St. Martin's Press. p. 166. ISBN 0-312-90207-7. ↑ Cagney, James (2005) . Cagney by Cagney. Doubleday. ISBN 0-385-52026-3. ↑ Raft denied entry into UK, news.google.com; accessed August 25, 2015. ↑ PROJECTION JOTTINGS New York Times (1923–Current file) [New York, N.Y] 19 Feb 1933: X5. ↑ Joan Bennett Set for 'Man in Iron Mask': Brent Plays Minister Atwill in 'The Gorilla' New Television Plans New Raft Controversy Schallert, Edwin. Los Angeles Times (1923–Current File) [Los Angeles, Calif] 20 Jan 1939: 10. ↑ Edwin Schallert Edwin. "Drama: Gann Book About Hong Kong Likely for Wayne; Gomez to Play Skipper" Los Angeles Times (1923–Current File), Los Angeles, California, January 1, 1954, pg. B7. ↑ Rocky Jordan infosite, thrillingdetective.com; accessed August 1, 2016. 1900 United States Federal Census, Census Place: Manhattan, New York, New York; Roll T623_1109; Page: 4B; Enumeration District: 642. Ancestry.com. New York City Births, 1891–1902 [database on-line]. Provo, UT, USA: Ancestry.com Operations Inc, 2000.